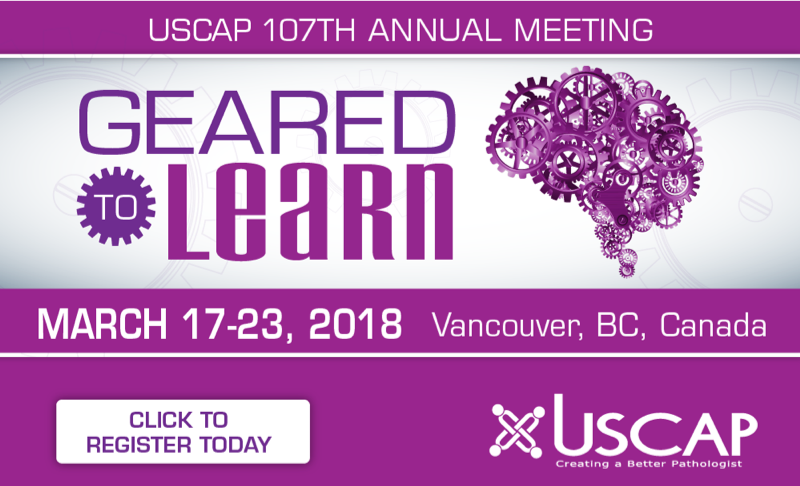 Thanks to Dr. Debra Zynger, The Ohio State University Wexner Medical Center, Columbus, Ohio (USA) for contributing this case and Dr. Belinda Lategan, St. Boniface Hospital, Winnipeg, Manitoba (Canada) for writing the discussion. To contribute a Case of the Week, first make sure that we are currently accepting cases, then follow the guidelines on our main Case of the Week page. (2) We have now posted the Jobs Report for the fourth quarter of 2017. To see it, click here. (3) Visit our blog page to see recent updates to the textbook. Visit and follow our Blog to see all recent updates to the website. A 49 year old man presented with a testicular mass. Spermatocytic tumor of the testis is rare, comprising 0.61% of all testicular germ cell tumors. Unlike other germ cell tumors, which preferentially affect young white males (20 – 30 years old), spermatocytic tumor more commonly affects older men in their 50s or 60s. 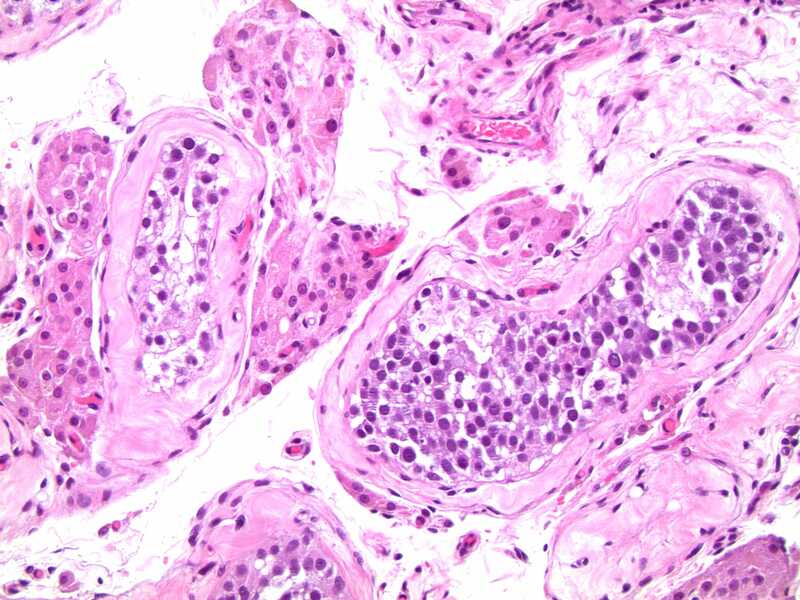 There is no association with cryptorchidism, it does not arise from germ cell neoplasia in situ (GCNIS) and has no known counterpart in the ovary or elsewhere. In the absence of sarcomatous transformation, these tumors lack metastatic potential and are adequately treated with orchiectomy alone (Arch Pathol Lab Med 2009;133:1985). Until recently, these tumors were known as spermatocytic seminoma. 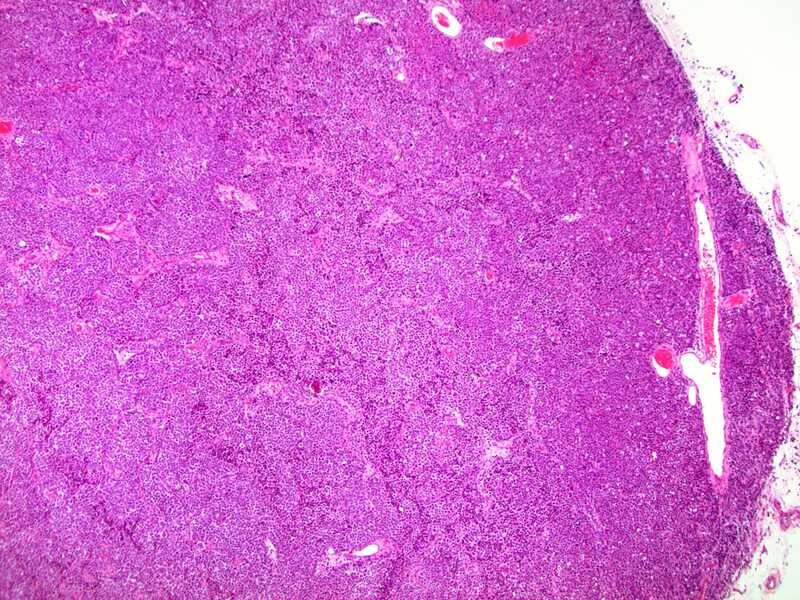 However, there is no association with seminoma or GCNIS, and in the absence of sarcomarous change, they are benign. For these reasons, spermatocytic seminoma has been renamed spermatocytic tumor (WHO Classification of Tumors of the Urinary System and Male Genital Organs, 4th ed.). Spermatocytic tumor presents as a painless unilateral testicular mass in older males, although young age and bilaterality does not necessarily exclude this diagnosis. Serum tumor markers are typically negative. Gross examination is characterized by a homogeneous, pale grey, solid and soft textured tumor confined to the testis. Areas of necrosis, edema, lobulation and hemorrhage may also be present. 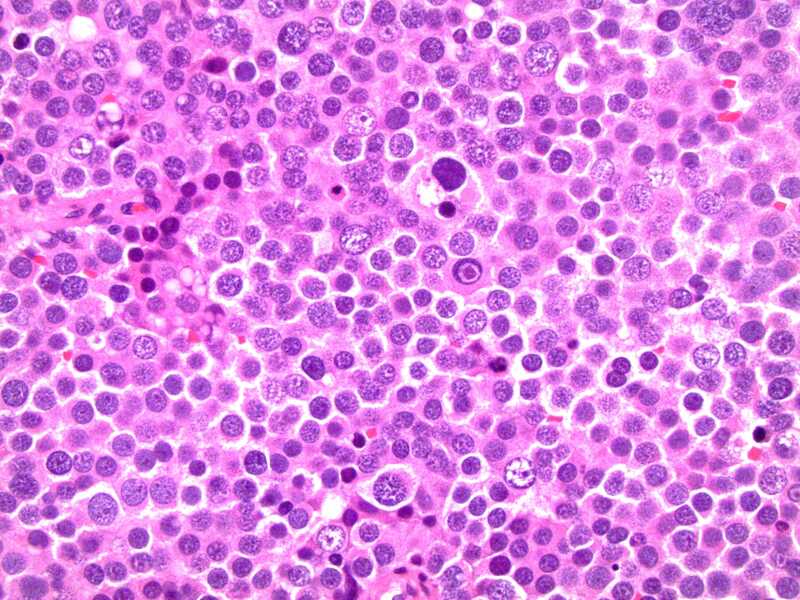 As demonstrated in the images for this case, three morphologically distinct cell types are noted on microscopy: small cells with hyperchromatic nuclei and scant cytoplasm resembling lymphocytes; medium (intermediate) sized cells with round nuclei, granular chromatin and dense eosinophilic cytoplasm; and large mono-multinucleated cells with round, indented nuclei and lacy chromatin. Mitoses are common and include atypical forms. The medium (intermediate) sized cells are often predominant and the other cell types may only be recognized when examining additional sections. 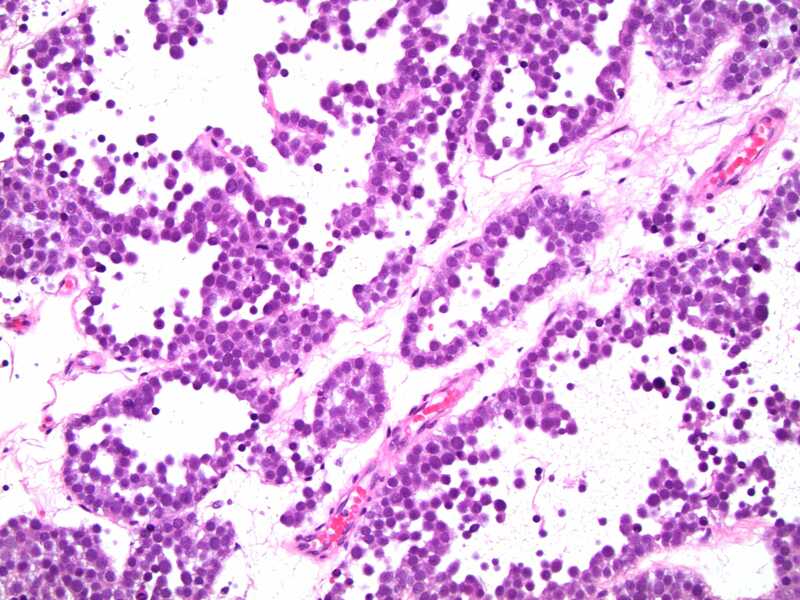 Germ cell neoplasia in situ (GCNIS) is absent and fibrous stroma, granulomas and lymphocytes are not features of spermatocytic tumor. 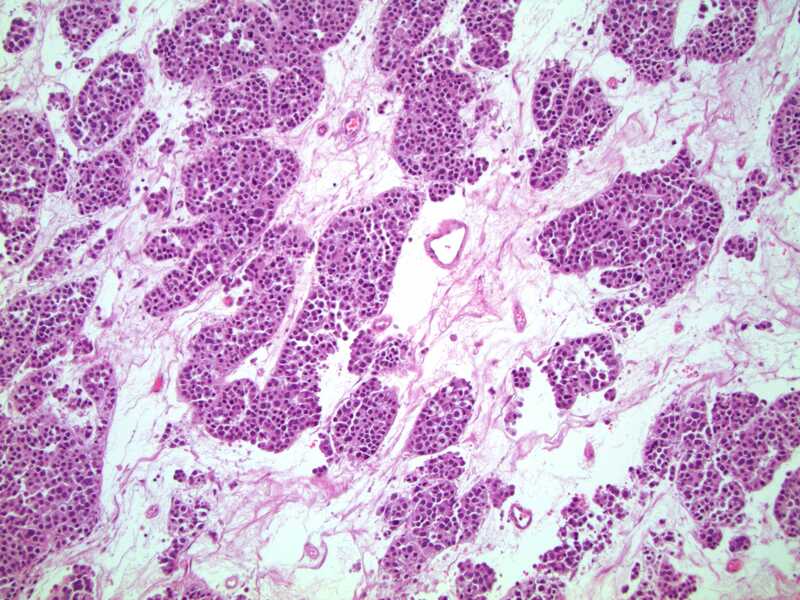 Prominent nucleoli, marked nuclear pleomorphism reminiscent of embryonal carcinoma, including bizarre multinucleated cells, are considered anaplastic change. Undifferentiated and differentiated sarcomatous elements (e.g. 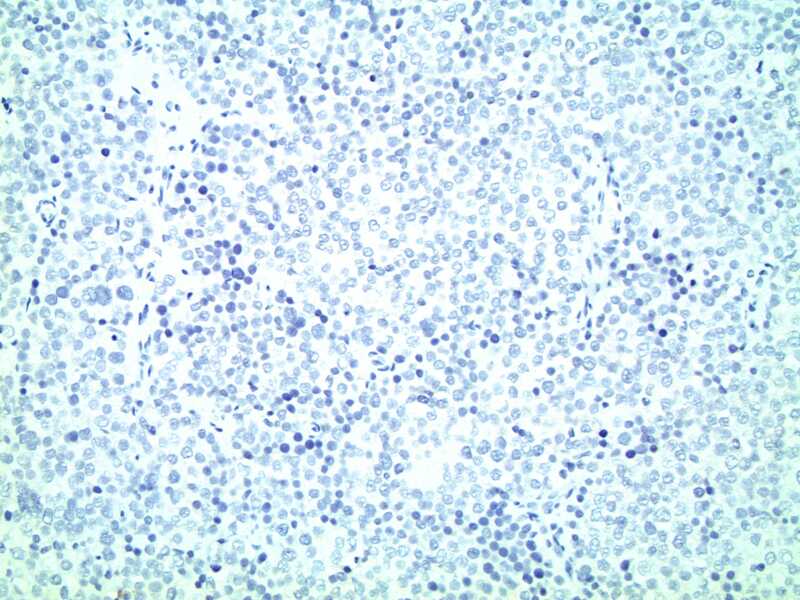 rhabdomyosarcoma) indicate sarcomatous change, and are more likely to metastasize. Sarcomatous change incurs a worse prognosis due to metastatic potential, whilst anaplastic change does not (Histopathology 2017;70:335, Am J Clin Pathol 1990;94:89, Am J Surg Pathol 1988;12:75). The tumor cells do not demonstrate intracytoplasmic glycogen on PAS-staining and are negative for most immunohistochemical markers characteristic of other germ cell tumors, including CKAE1/AE3, PLAP, OCT3/4, and CD30. c-Kit may be expressed in up to 40% of spermatocytic tumors. 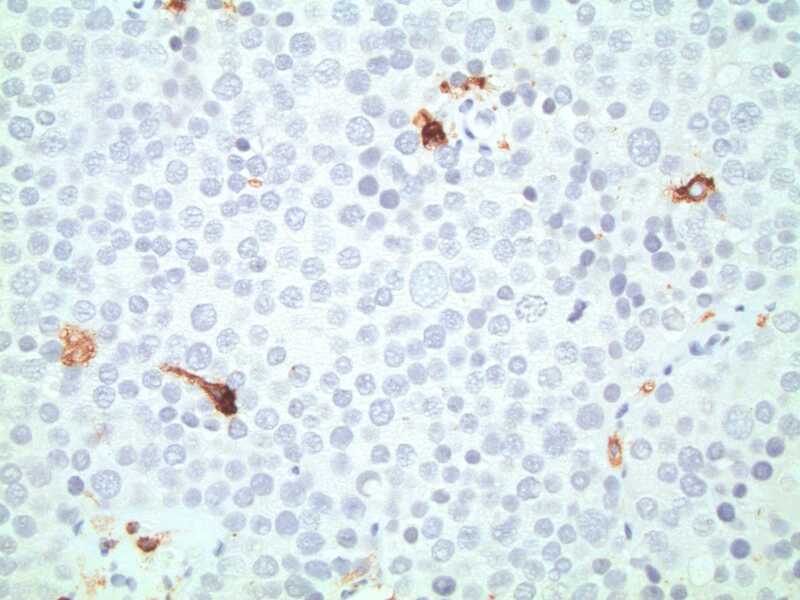 The lack of a lymphoid component, as demonstrated by the absence of staining with CD45, further underscores the diagnosis in the case presented here. Gain in chromosome 9 is the most consistent cytogenetic abnormality, in addition to gain of the X chromosome. Anaplastic change does not carry a worse prognosis. Spermatocytic tumor does not arise from germ cell neoplasia in situ (GCNIS), and this finding should not be present when a diagnosis of spermatocytic tumor is being considered.